October saw the second of this years AAPGAI Assessment Weekends. Guests, senior assessors, current AAPGAI instructors progressing further, and wannabe instructors taking Provisional exams for the first time all gathered at Caerberis, Builth Wells, Powys. 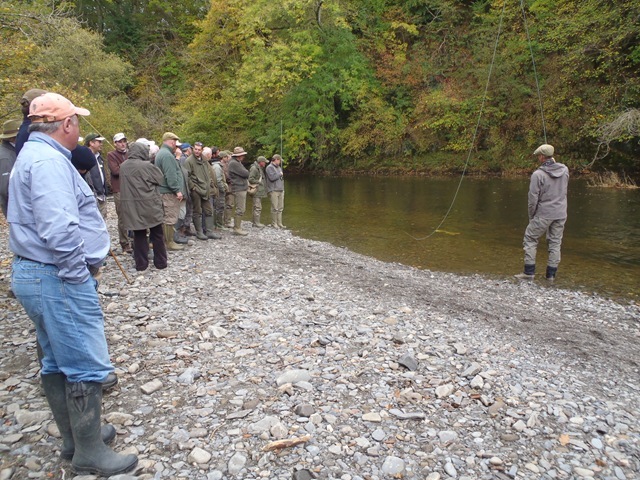 Over a 3 day period and with favourable conditions, each candidate was scheduled to take to the river (Wye) in front of their team of assessors and deliver their chosen Syllabus. An excellent turnout saw a pass rate this year of 62%… a great result from some very well prepared and skilled candidates. Following the 3 days of exam assessments, we concluded with our popular Open Day on Saturday the 16th. This is a great opportunity for ‘would be’ instructors & the general public to watch and participate in fishing, fly tying and fly casting demonstrations in one form or another, as well as receive 1-2-1 instruction from one of the many AAPGAI instructors in attendance throughout the weekend event. … all well attended & received by an enthusiastic audience.